Oh man. Oh man. I really can’t stop saying that. Which means I’m talking to myself. When I think about you, I talk to myself. Not quite how the song goes but you will see what I mean. This is the ultimate platter of super tasty, super healthy, food gasmic-y goodness that you should bring to every party you go to. From now on. It is vegan and low-fat and you might just embarrass yourself if you turn into an enthusiastic Mr. Peepers while eating it. You’ve been warned. 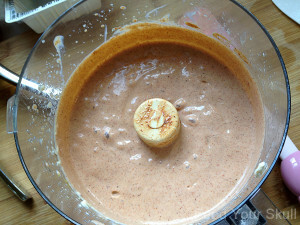 The base is an easy combination of silken tofu, lemon juice, apple cider vinegar and Lawry’s Taco seasoning. 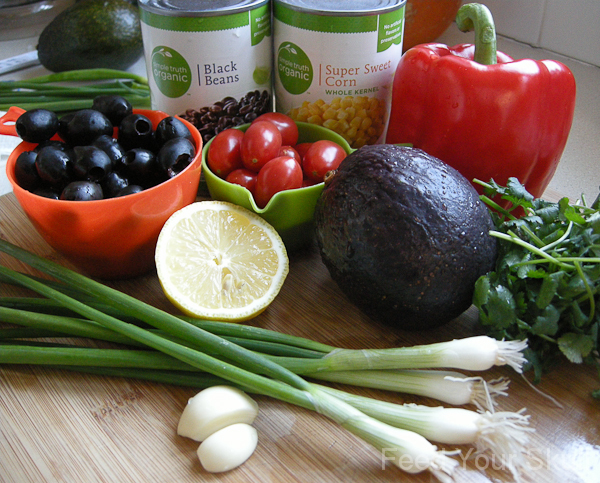 Toppings are next, using a blend of satisfying vegetables mixed with salsa for a savory finish. Feel free to add a jalapeño or cayenne pepper if spiciness is preferred. 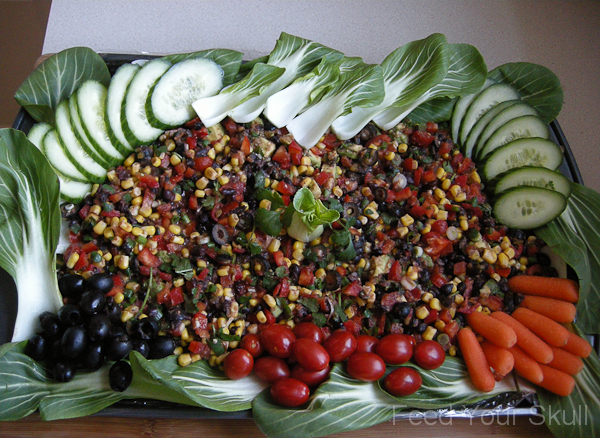 Have fun plating and loading on even more veggies! So many vegetables also make great dipping vessels. 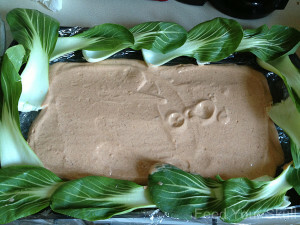 Place 2 sheets of saran wrap down on a 17.25x11.5x1 inch pan and garnish the edges with baby bok choy. Set aside. In a food processor, blender or even in a bowl with a whisk and muscle; add silken tofu, garlic powder, apple cider vinegar, juice from half the lemon, nutritional yeast, and taco seasoning - mix well. It should look smooth. Spread out on the pan. In a large bowl gently fold together the black olives, black beans, corn, red pepper, green onions, garlic, cilantro, avocado, juice of the remaining lemon half and salsa until mixed. 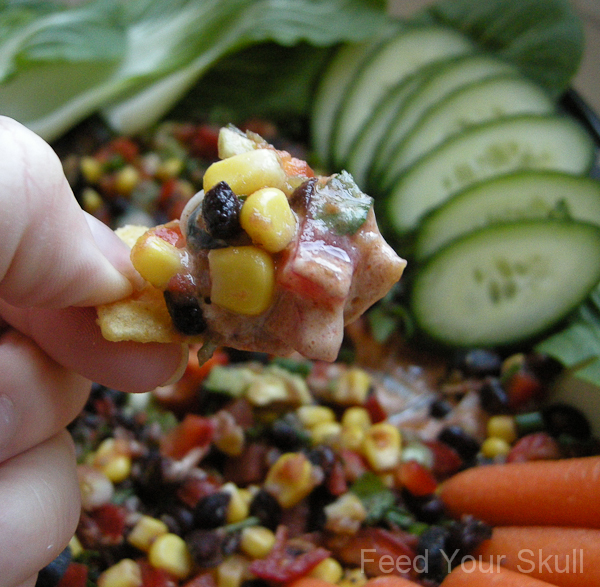 Using a serving spoon, gently place over the taco dip. 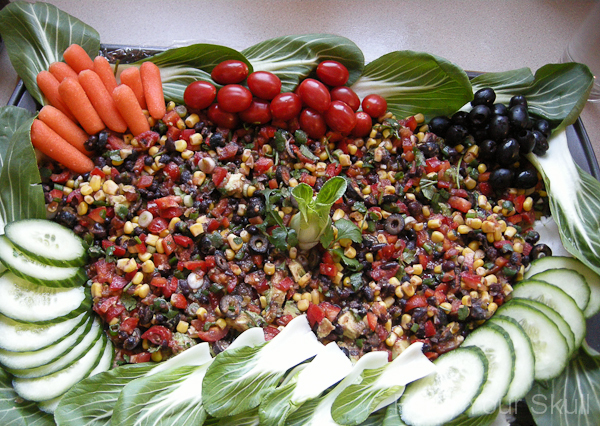 Garnish with your favorite veggies that can also be used as dip vessels. Cucumber and zucchinis when sliced at a long diagonal make perfect large 'chips'. Tortilla chips are also great. 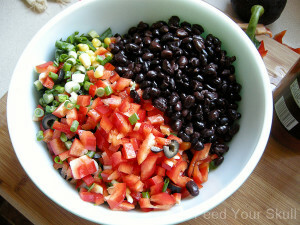 This can easily be assembled upon arrival by bringing/storing the taco dip and veggie/salsa mix in separate containers. A tofu 'cream cheese' or homemade cashew cheese will provide a firmer base for the salsa veggies whereas the silken tofu is more like a sour cream texture. All are good options based on your preferences. Hummus could even be used! 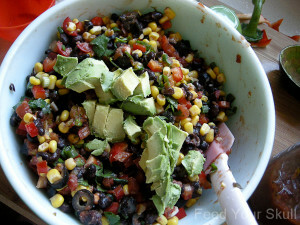 I’ve made this dish in the past, numerous times, and it is always a big hit at parties. I’ve updated this version to satisfy my love of veggies and vegan ways. I’m thrilled that tofu transformed a heavy dairy cream cheese dish into this. I’m willing to bet no one would guess this is a dairy-free dish. Thanks to my former co-worker J.K. and his wife for first turning me onto this fantastic party platter.